After weeks of speculations about the possible presentation of iPad 3, tonight Apple began sending to all journalists in the U.S. and worldwide guests for the event which will take place on March 7. In San Francisco – Yerba Buena Center, Apple will present to entire world the new tablet with the new iOS 5.1 and the rest of “goodies” that Tim Cook and engineers from Cupertino have been worked in the last few months. Retina display is actually a screen with a resolution of 2048 x 1536 pixels, 4 times higher than iPad 2 (1024 x 768). 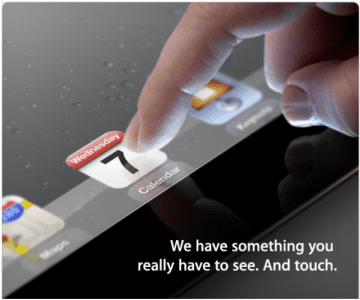 A few minutes ago, Apple sent the above picture with an invitation to the event where they will present the new iPad 3. Many journalists from around the world have received this email from Apple and the company confirms the existence of a Retina Display. Why do I say that? Well, take a look at the icon’s clarity, which does not apply in iPad 2 case. The initial image of the tablet does not display a Home button which begins to give rise to different theories so it’s possible that the tablet will come without the famous button to close applications, that help us and do various other tasks, etc. The guys from Gizmodo have compared a picture of the iPad 2 with iPad 3 to support the theory that iPad 3 will come with Retina Display but also to sustain that the picture sent by Apple was taken in portrait mode and would give the impression that new tablet won’t come with a home button.